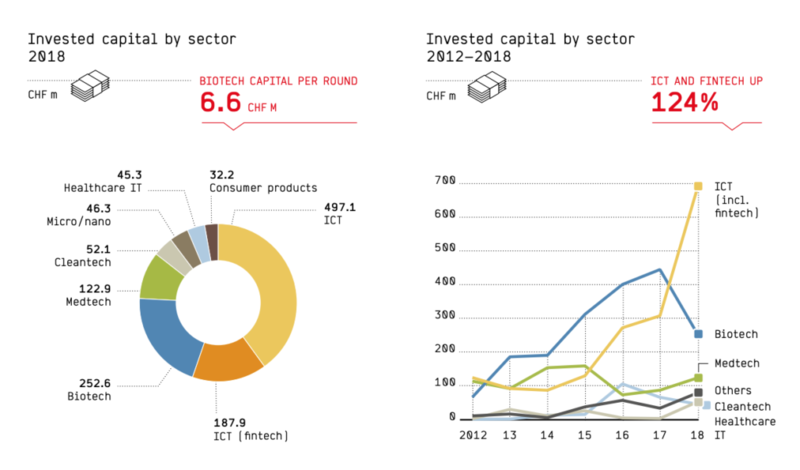 For the first time, Swiss information and community technology (ICT) and fintech startups raised more money than life sciences companies, with nearly 60% (131) of all financing rounds in 2018 being completed in ICT and fintech, showcasing strong interest from investors in the two sectors, according to the annual Swiss Venture Capital Report 2019. In 2018, a total of CHF 685 million was invested in ICT and fintech startups. This is more than half of the total invested capital (or 55%) into Swiss startups. 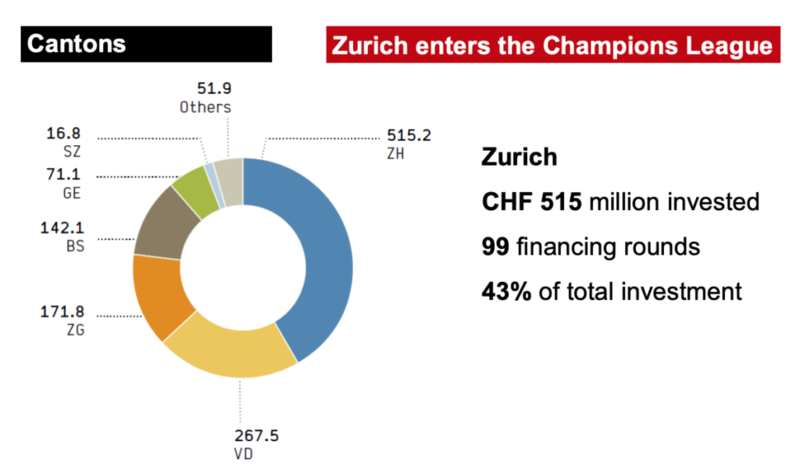 ICT startups raised CHF 497.1 million (40% of the total invested capital into Swiss startups) and fintech startups raised CHF 187.9 million (15%). The largest funding round of 2018 went towards fintech startup SEBA Crypto, which raised CHF 100 million in September. Zug-based SEBA Crypto is building a regulated Swiss bank offering cryptocurrency services to companies and investors including crypto trading and investments, initial coin offering (ICO) advising services, corporate financing, and more. Another fintech startup that got into the top 20 largest funding rounds of 2018 is Numbrs, formerly Centralway Numbrs, which raised CHF 26.7 million. Numbrs offers an app called that aggregates bank account and credit card information and facilitates mobile banking and personal financial planning. Other fintech deals that took place last year include Advanon, Algotrader, Bloomio, Carbon Delta, LEND, Lykke, Metaco, Monito, Mt Pelerin Group, neon, Smart Valor and Taurus Group. 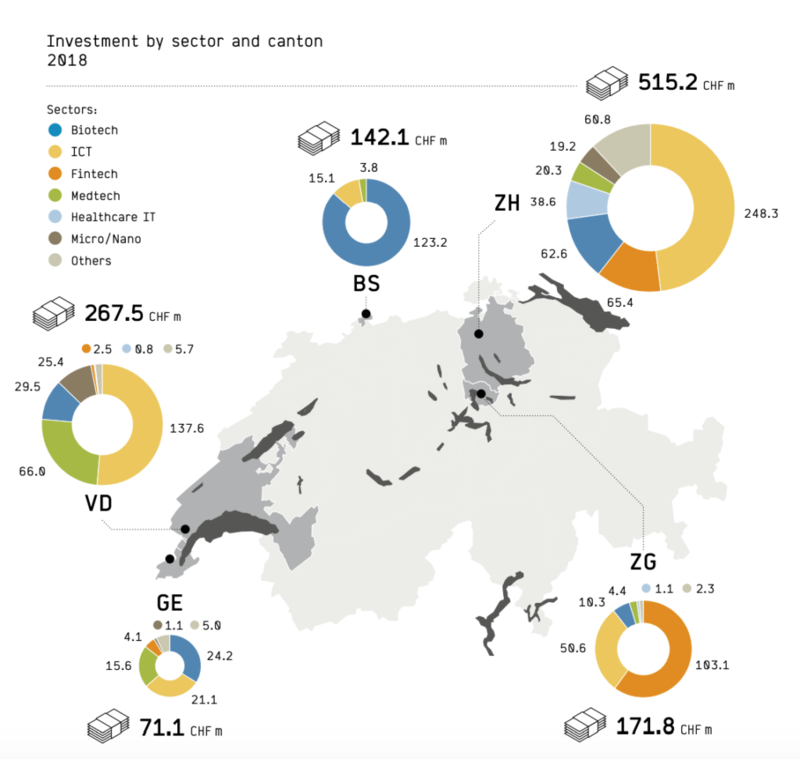 Startups from the canton of Zurich took most of the total amount of funding raised in 2018 by Swiss startups with CHF 515.2 million (43% of total investment), an increase in volume of 88.7%. 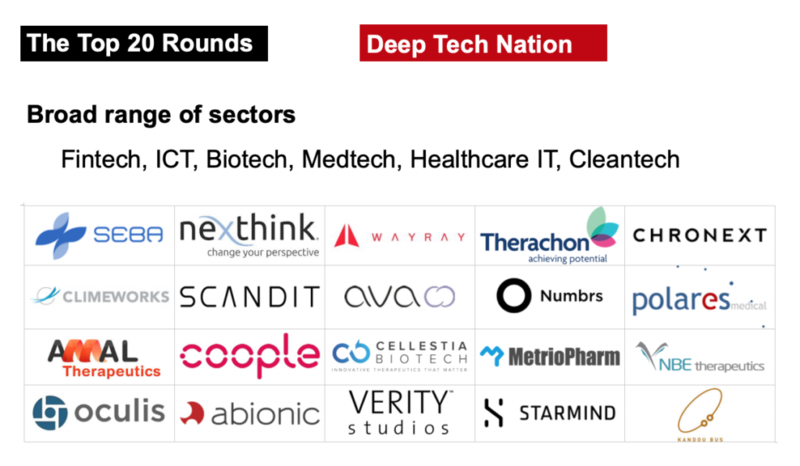 Nine of the 20 largest financing rounds were raised by startups based in Zurich. These come mainly from four sectors: ICT, fintech, biotech and healthcare IT. 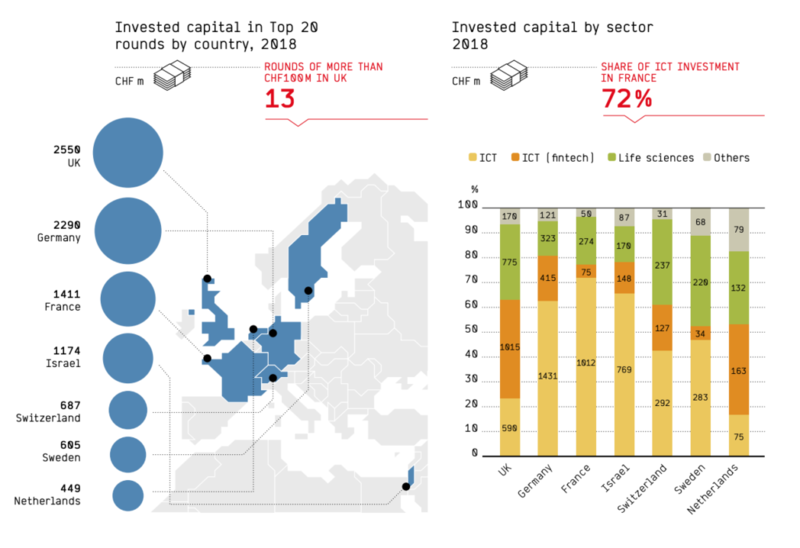 Zug and Basel-Stadt are the two other cantons where investment in 2018 rose strongly. Zug saw a volume increase of 143% (to CHF 171.8 million) and Basel-Stadt an increase of 72.7% (to CHF 142.1 million). Fintech companies generated 60% of risk capital in Zug, also known as the Crypto Valley for the high concentration of cryptocurrency and blockchain startups. The report also mentions the most important trade sales of 2018. In fintech, these are Bexio, a business software provider acquired in July by insurance group Mobiliar, finovo, a platform that makes it easier for pension funds to manage their mortgages acquired by mortgage broker Moneypark in February, and Innoveo, an insurtech provider acquired by Servion Global Solutions in March. The Swiss Venture Capital Report 2019 features a special segment on the crypto space and the token economy, which has been growing rapidly in Switzerland supported by the Swiss Financial Market Supervisory Authority (FINMA)’s intelligent guidelines on crypto and ICOs, the research says. It mentions the case of German serial entrepreneur Paul Claudius who founded Blockstate in Zug in April and has been gradually transferring the operational focus to Switzerland where the market entry will take place. Swiss ICOs raised only CHF 233.5 million in 2018 compared to CHF 728.2 million in 2017. Last year’s largest token sales were Nexo with CHF 52.5 million, Swissbord with CHF 52 million and Trade.io with CHF 31.2 million. In 2018, Swiss startups received significantly more funds compared to previous years as investors and business angel clubs became more active. 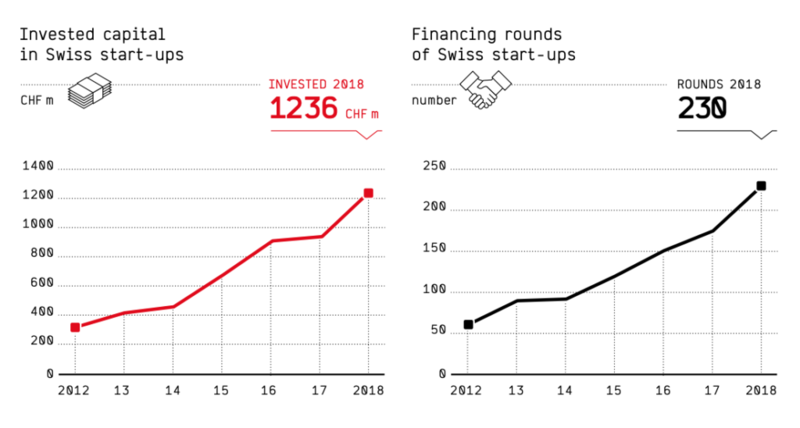 Investment in Swiss startups hit the billion mark with nearly CHF 1.24 billion flowing into domestic startups, up 31.8% since the previous year. The rise is due mainly to the upswing of the ICT sector, including fintech. Swiss startup funding fell behind its European neighbors. By far the most capital was raised by startups in the UK and Germany with US$2.6 billion and US$2.3 billion respectively last year. This was followed by France and Israel, each with more than CHF 1 billion, while financing volumes in Switzerland, Sweden and the Netherlands were between US$500 million and US$700 million. In fintech, the UK and the Netherlands were the leaders in 2018. UK fintech startups raised more than CHF 1 billion in 2018 while Dutch fintech startups raised CHF 163 million. 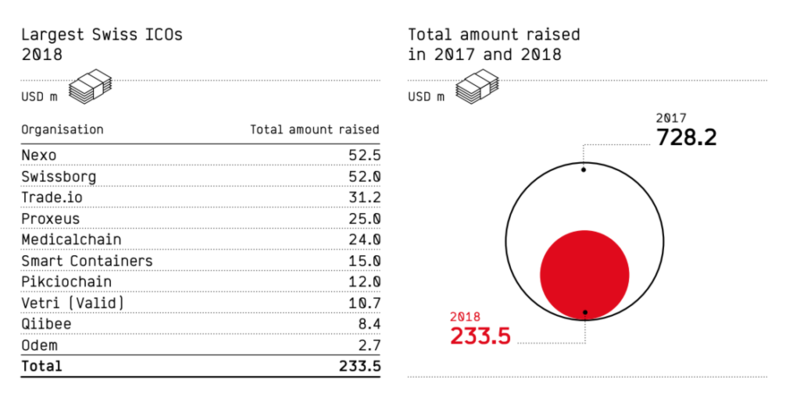 The post Fintech Highlights of the Swiss Venture Report 2019 appeared first on Fintech Schweiz Digital Finance News - FintechNewsCH.